Have you ever held a nursing child that is hungry? Their mouths open and close like baby birds moving their heads, striving to find the mother’s milk, never stopping or resting until they find it. 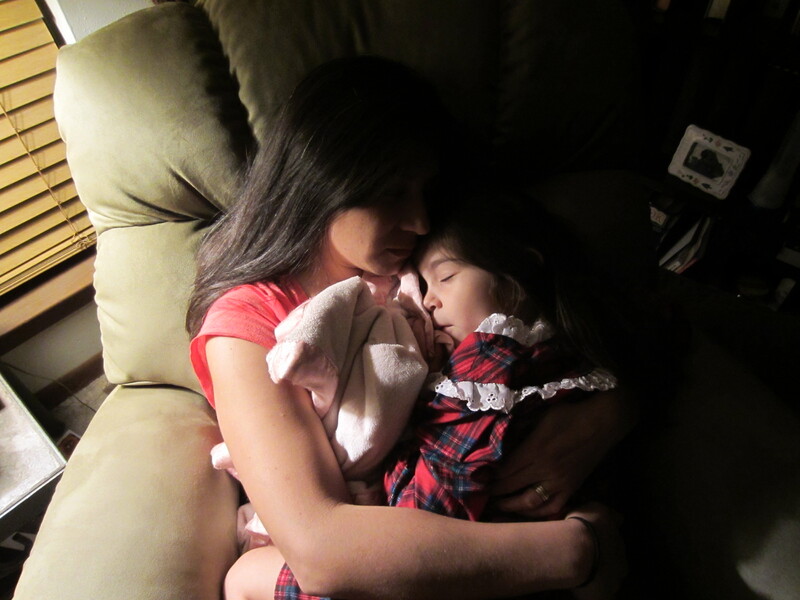 Have you ever seen a weaned child sleep on her mother’s chest? The child is still, peaceful—just resting, remaining, abiding. What a beautiful picture of what our walk with Jesus Christ can be if we just rest and abide in Him as He tells us in John 15:5. I know this truth, and I want this, but sometimes I am like a nursing child reaching, striving and not resting. Again, struggling because I want to do BIG things for God, I want to ‘go up.’ Then I get a revelation…again. I am doing BIG things for Him. He has given me the role of a Mother. He has given me instructions and tasks He has for me according to His perfect will. I have the privilege as a Mother to fill my children with His love, making them wholehearted children with undivided hearts completely devoted to Him. I have a calling. I have a mission…and I feel the deep sense of purpose as a Mother as never before. 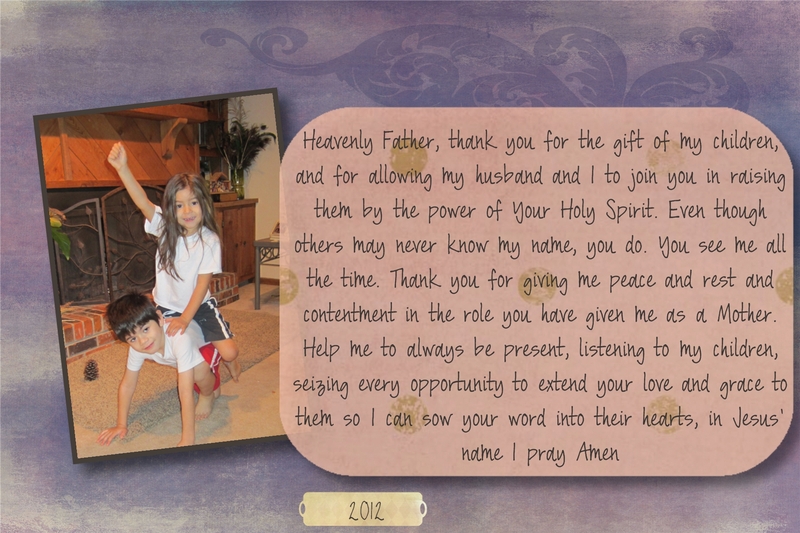 I want to be present, available, flexible, teachable, moldable for God so He can love my children and others through me. In Judges 13:1-25 God confirms this new conviction He has given me. This is a true story about the parents of Samson, the one who began to deliver Israel from the hands of the Philistines. Samson’s Mother was visited by the angel of the LORD and was told she would give birth to a son (even though she was barren). Wow! Pay attention! Only a woman can carry a child in her womb by God’s grace and be called a Mother. Only a Mother can eat or drink the right things that will impact the growth of the baby in her womb. This is by God’s design and purpose. Pregnancy is a beautiful picture of God working in and through us for His good purpose but it does not end there. In fact, there are plenty of Mothers that have not carried their child in the womb but they must also ‘pay attention’ to all that God has said, making sure she is eating and drinking the right things that will impact the spiritual growth of her child. All of us Mothers need to be eating ‘every word that comes from the mouth of God’ and making sure our hearts are clean and we are ‘filled with the Spirit not drunk on wine.’ How else could we ‘pay attention?’ Out of the heart the mouth speaks—we have an opportunity everyday to see what is in the hearts of our children if we listen to them…and to the voice of the Holy Spirit. I want to LISTEN to the desires in the hearts of my children and watch what they are interested in and how God has uniquely designed them. I want to cultivate the garden of their souls, planting His seed in their hearts, pulling the weeds, and planting in every area so something else not of Him does not spring up. By His grace I can do this. By His grace alone, I am learning to be content with the portion He gave me. By His grace I will keep my eyes fixed on Him, the Author and Perfecter of faith. What an honor to pray my children into His kingdom. To love them into His Kingdom. To help them learn to hear His voice and help them be lights in this world wherever He sends them. What a purpose I have in God’s plan! This realization and revelation causes my soul to rest. I do not desire to be anywhere but where He has me and I consider that His grace. I am thankful I can re-read this post and reflect on this stone of remembrance for those days I ‘forget’ my calling as a Mother. What about you? Are you resting? Do you see your purpose as a parent in God’s plan to love your children into the kingdom? To listen and pay attention to all He tells you? If you are not a parent yet, are you preparing your heart now by drawing near to the One who will help you raise them? This entry was posted on Saturday, February 25th, 2012 at 6:17 am	and tagged with abiding, Bible, children, God, holy spirit, Jesus, knowing God, love, Mommy, Mothers, responsibility, resting, striving, weaned and posted in Meditations of His Word, Stones of Remembrance. You can follow any responses to this entry through the RSS 2.0 feed. « Christianity is not about doing, it’s a state of being. That truly is a beautiful picture of resting in the love of Christ! Thank you Jessica 🙂 I’m thankful for that conviction to rest in His love and im thankful for the encouragement of others like you to keep seeking first His kingdom and righteousness. Ah, thank you for that drink. Thank you for stopping by the well Emily! I stopped by your place too…I like “Traded everything for Truth” Yes!!! That is awesome. You have a beautiful family too! Thank you for sharing Scriptural prayers, God’s Word does not return to Him void, He looks to perform His Word. What beautiful words of encouragement, and Biblical Truth, Arcelia. Thank you for visiting my blog today so I could find this blogging treasure! Thank you Michelle, I was delighted I found your blog…a ‘well’ filled with rivers of flowing water I can meet you at–keep it up! You have a beautiful, loving Mother’s heart. It is the most important job a woman can have. I am so glad you realize how important it is. Not all that many years ago (in the 1970’s–“Women’s Lib”), homemakers and mothers were looked down on and made to feel as if raising the next generation was insignificant. I had my children in 1977 and 1980 and I felt like a nobody! Blessings to you and your family! Thank you Joy, it’s just the evidence of the new heart God gave me. I’m thankful I finally realize the importance of being a wife and Mother as it pertains to God’s purpose. I was in the military 10 years and Corporate world three years until I surrendered and our Lord told me to follow Him. So I left my ‘waterpot’ and went to tell others beginning with my own family and I haven’t stopped. I desire to encourage Mothers to step into their God given purpose as a wife and Mother through Jesus Christ by the power of the Holy Spirit. What’s interesting is you said as a Mother in 1977 and 1980 you felt like ‘a nobody’ — In this passage Samson’s Mother was never named…she’s referred to as a ‘wife’ or ‘woman’ Instead, the family name ‘Danites’ and the name of the Father was written, which reminds me how the man will be held accountable for his household. Yes! Men accountable for the household and how many men and Fathers are missing from the household–due to abandonment, divorce, or ones never haven taken the responsibility to marry the mother. Tough times for families! To be fair, it was not only the “women’s Lib” line of thinking that made me feel unworthy, it was also the fact that I was not a Christian and was not aware of my position and worth in Christ. “Vee get old too soon and smart too late” ! Ha! Better late than never, though! Thank you for sharing that it was not only ‘women’s lib’ that made you feel unworthy, but ‘the fact that i was not a Christian and not aware of my position and worth in Christ.’ So true, so true. Without Him, we believe lies. And yes ‘better late than never’ that’s what I say too–I waited until my 30’s to taste and see He is good.